Try renaming that "Videos - Copy" folder to "Public Videos". You'll then have two folders named the same. That's irrelevant. 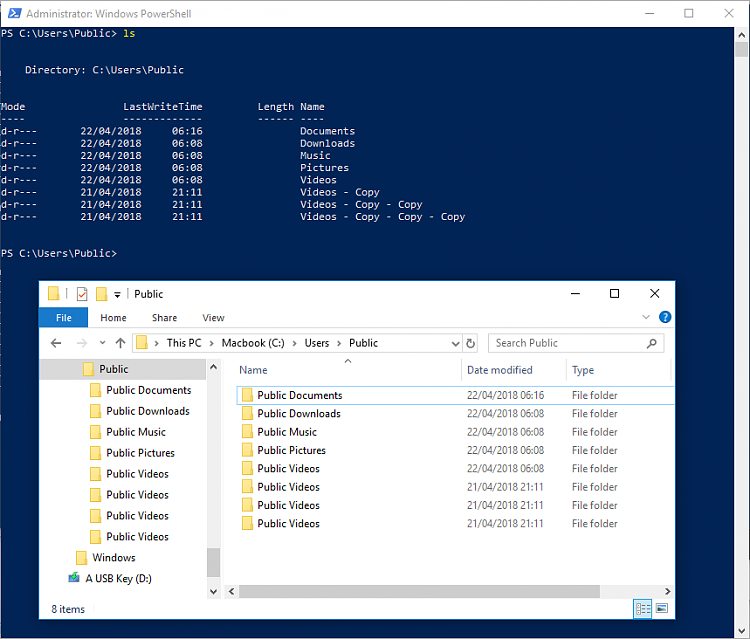 The point is that if in File Explorer you copy the folder shown as 'Public Videos' (but actually named C:\Users\Public\Videos) in Windows 10 it is displayed as another 'Public Videos' folder (but actually named C:\Users\Public\Videos - Copy). In Windows 7 it is displayed with its correct name. This bug exists in 10, but not in 7. Well this is pointless, you don't think it exists in Windows 7 even though I demonstrated the same issue happening. The only difference is the way the copy/paste function in explorer works is different in 10 than 7. Windows 7 when you click copy and paste, it creates a copy of the real folder name. Windows 10 when you click copy and paste, it creates a copy of the alias folder name, which makes more sense. If anything it is a bug in earlier versions than 10. AndreTen has already proved that it creates a folder named 'Videos - Copy' as it should. The bug is that File Explorer doesn't show the true name of the copied folder. lx07 who first reported this problem in post #365 shows the same thing. This how the same copied folders appear in Windows 7 - all names correctly displayed. Last edited by Bree; 21 Apr 2018 at 18:17. The special folders contain a hidden file that Windows explorer reads and follows the code in the file to adjust the display and name of the folder. My 'Copied' then 'Deleted' folders aren't even showing up in the Recycle Bin! The whole special folders coding system goes back to the later win 3.x and was also in the 9.x systems, I think it it used to be a desktop.ini file but will have to confirm and check if it's still done the same way. Isn't what we should get. That's what I'm getting on both accounts. Upgrade! I was all prepared to ask the same question, Mike, but reading a bit more carefully, I'm not sure that's what they're talking about. So, I have the snippet but decided not to ask the question.